Flying Wings have always been fun to fly. However they require precise design and calculations to get them fly just right. Vortex-RC is proud to introduce the VT-Speedster and the VT-Speedster Pro. Designed and built to perfection , The Speedsters have ‘just’ the right airfoil, taper, sweep, twist and CoG. 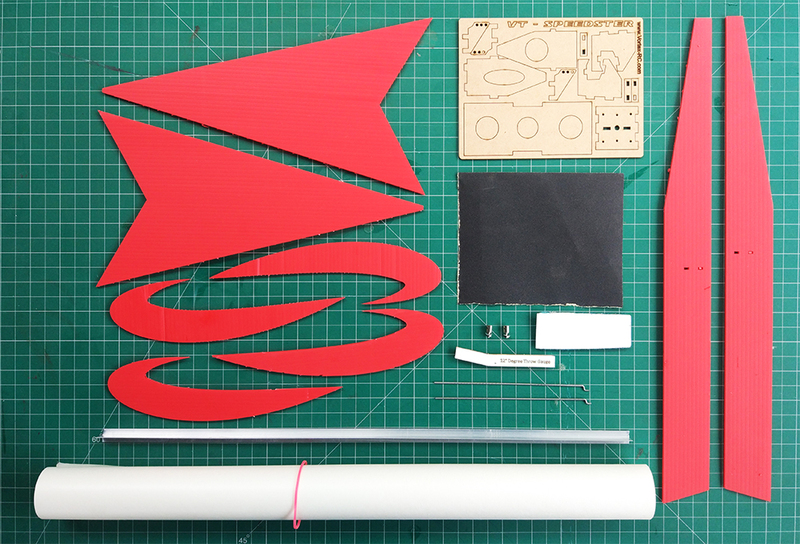 Build is super easy, and well illustrated in our manual, and fully covered in the build videos. 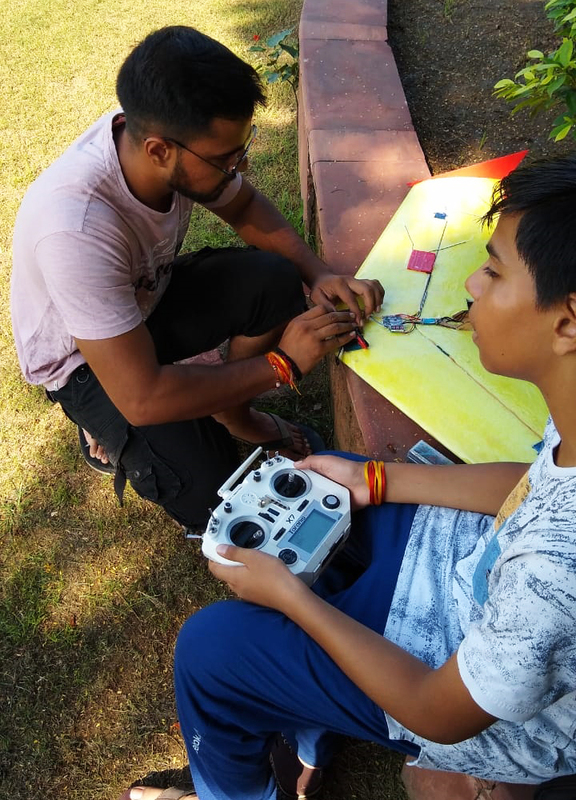 We are sure the VT-Speedster and the VT-Speedster Pro will be loads and loads of fun to fly with. VT-Speedster is a lot of fun to fly around. Designed to fly with the popular 2200mah 3S Lipo, it can be flown in small parks and fields and is super easy to transport and maintain. Flying the Speedsters is Super duper fun. Once trimmed, she flies as if on rails, with a wide speed envelope and excellent wind penetration. 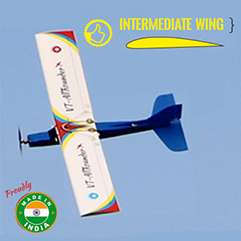 Dazzle your friends with hi-speed low-passes and build your skills to do high speed full throttle accurate flying. 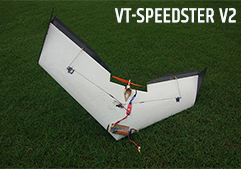 We have worked upon tweaking the low speed performance of the VT-Speedster and VT-Speedster pro to let you launch and land easily. A gentle toss and up she will go. Floats and slows like a trainer to land. Our videos will show you how to launch the Speedster like a Pro in a matter of few minutes. 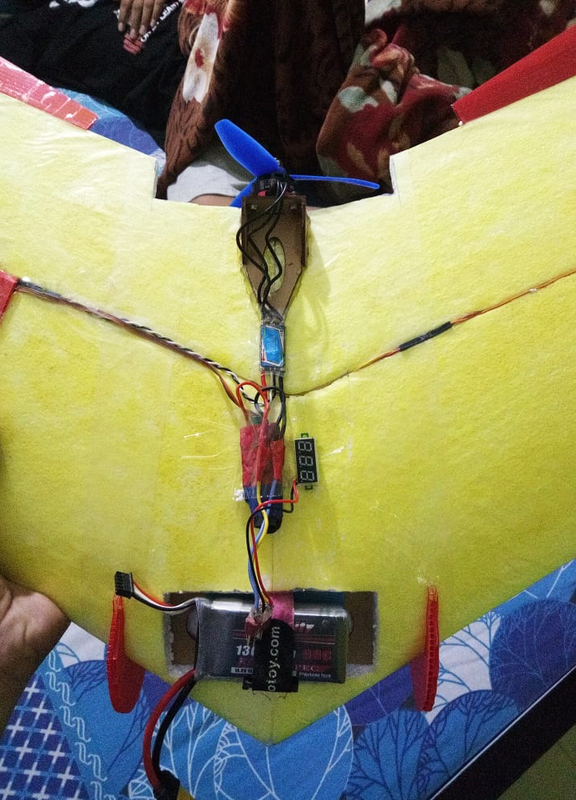 Flying wings require special ‘Reflex’ airfoils to give them performance. 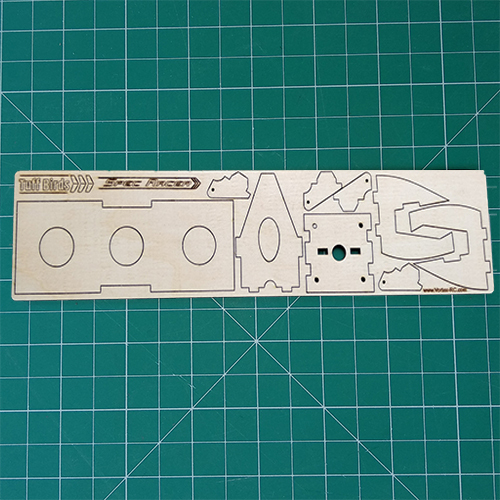 We have chosen the best for you – CNC cut for you with precision. High efficiency gives you lots of endurance and range. The VT-Speedster Pro is an excellent FPV performer. Mount your favorite gear and enjoy the speed and thrill of fast FPV flying. Once you get addicted everything else will become boring ! VT-Speedster, with its ultra efficient design will give you awesome endurance and range for your FPV. 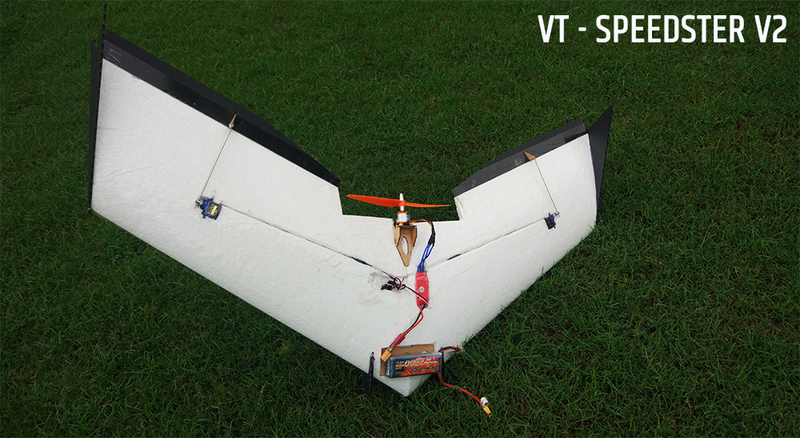 VT-Speedster VT-Speedster and VT-Speedster Pro can be assembled and flown in less than 2 hours of build time. Put on some music, read and follow our manual and in no time you will be ready to fly ! Unbelievably low cost makes the Speedsters super affordable to all RC aeromodellors and FPV enthusiasts. Our goal of making the hobby popular has ever been more important enough. We went to all lengths to source local materials to keep the costs low, but never at the expense of flying characteristics. 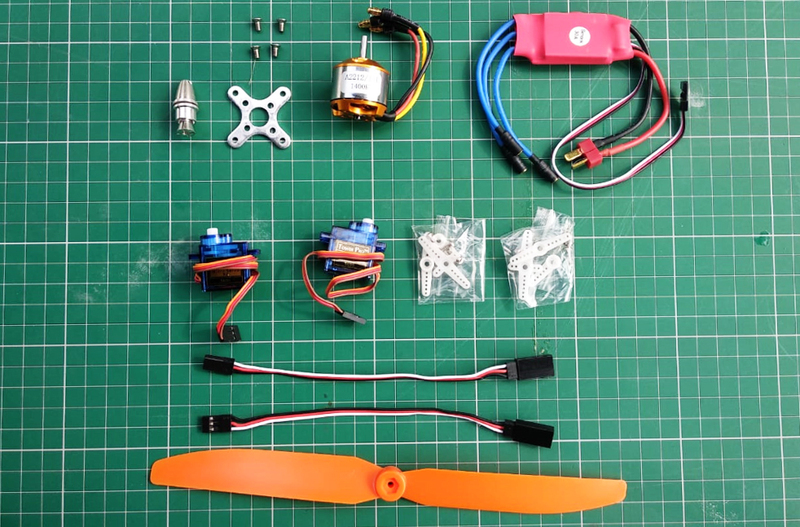 Go ahead and enjoy the goodness of RC and FPV without breaking the bank. High density EPS foam ensures your plane is light, yet strong enough. Laminating the wing adds tremendous strength by acting as a ‘stressed skin’. It also makes it less vulnerable to hangar rash and small dents and nicks. Coroplast is light, and resilient to crashes. It will bend, but will not break. 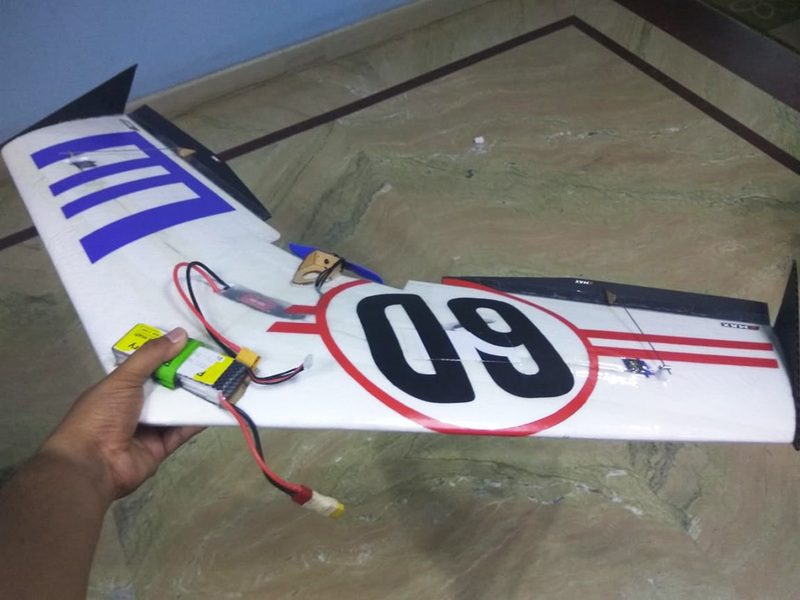 Know the most important factor that determines how good a model airplane flies ? Wing loading. 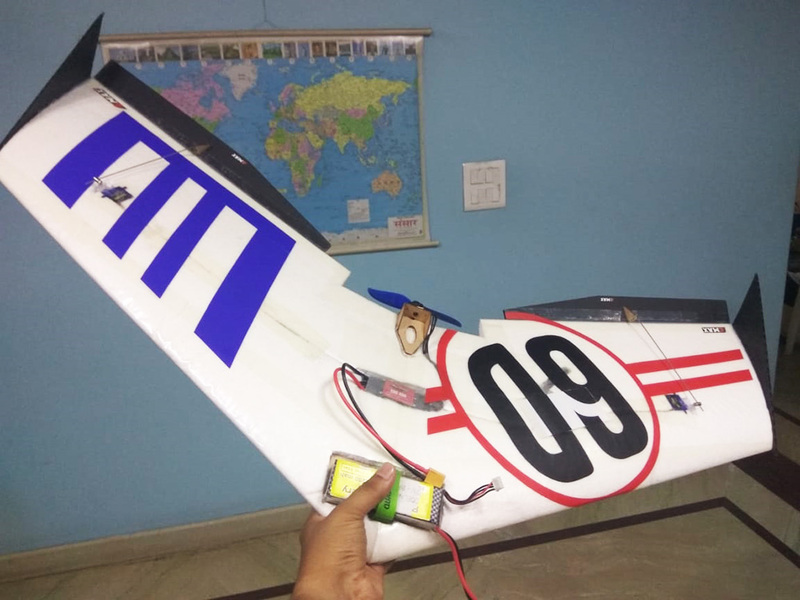 The lighter the wing loading, the better the model flies. We boast of a wing loading as low as 10 oz/ft2 . Perhaps the best you can get. Light wing loading gives a wide speed envelope which makes the VT-Speedster float like a trainer on landings. Specially designed skids and winglets absorb all the impact on landings and save the wing from damage. The skids double up as protector for cameras and FPV gear up front. Winglets provide lateral stability. Hard landing ? No problem. Just bend the winglet back in shape. 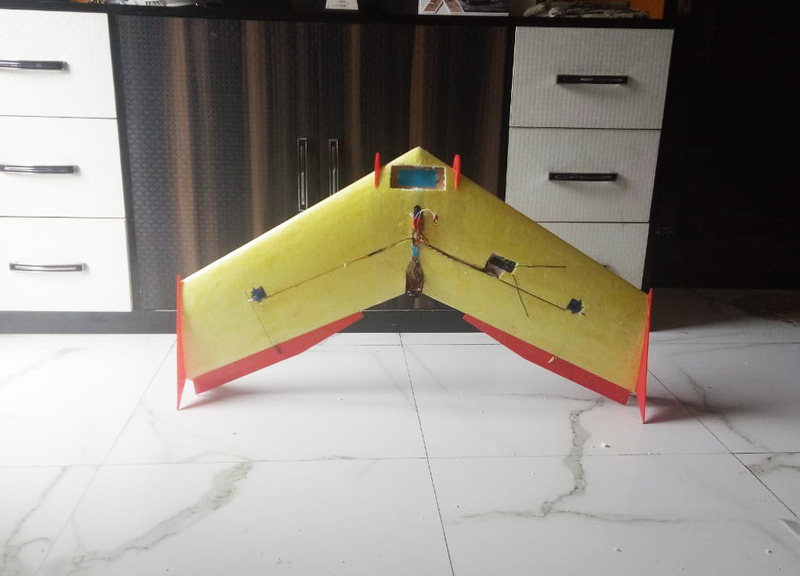 Easy to launch and and, you no longer need a runway to fly! 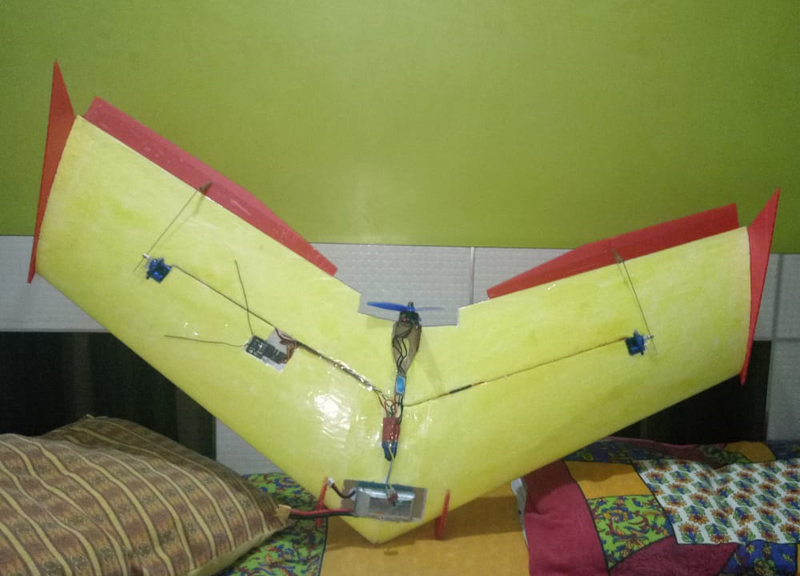 Wing area: 460 sq in. Wing loading: 7 oz/ sq. ft.
1 Nos Lithium Polymer Battery Charger. 4 Channel or above radio set (Tx and Rx) with Elevon mixing feature. 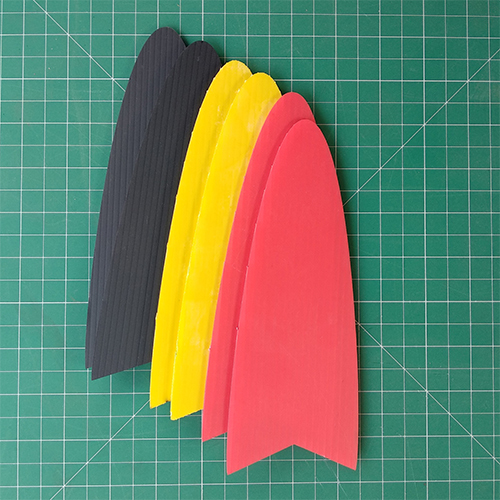 Color of coroplasts sheets used for our airplane, or parts may change as per the availability. Your kits shipped may be in a different colour than illustrated. Hot wiring CNC cutting on foam sometimes leads to fine lines on foam, as it is processed. These, in no way hinder or affect the quality of the finished product .These lines can easily be sanded out. Our Q/A process examines each wing core before they are packed and you can be assured that you will get only the best. 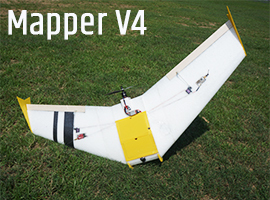 With 2 X 3300 mah 4S Lipo/1x 8000 mah 4s lipo, the Mapper V4 can fly upto 45 minutes and covers nearly 45Km in cruise flght. Can carry a downwards facing HD Camera for Photomapping applications.